Real Dry Waterproofing provides full-service solutions for battery-powered pump backup systems in western Massachusetts, Boston, the South Shore, Cape Cod, southern New Hampshire, northern Connecticut, and Rhode Island. Don’t be caught with your home unprotected during a power outage or equipment failure! Real Dry can offer a solution that protects your home even if your sump pump or perimeter drainage system fails. Why do I need a battery backup? Power outages, pump failures, and carelessness with maintenance can all lead to possible water infiltration – even if you invested in a sump pump and a perimeter drainage system. FACT! Battery Backup systems will save your investment from a flood. FACT! Insurance companies won't pay for flood damage on your home without proper flood protection devices like a sump pump. Some policies even require backup systems. Not all battery backup pumps are created equal. Pump quality, battery size, and the number of batteries (along with the reliability of your electrical service provider) all affect the quality of the system – as well as how long your backup system will perform. Real Dry has been installing backup systems since 1985 when the first generation of models came to the market. Things have progressed since those early, stripped-down versions, but the concept is primarily the same. 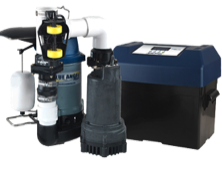 We use and recommend several different pump and battery backup system brands, including Wayne, Sumpro, Blue Angel, and NexPump. Ask us about the variety of systems available for immediate installation, including backup systems that can even call your cell phone or send you text alerts and updates on its service. 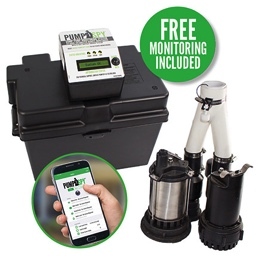 PumpSpy makes great products, and Real Dry is happy to recommend and install the PumpSpy Combo Kit – a system that includes both primary and backup sump pumps, complete monitoring capabilities, a battery case and all necessary switches! Depending on your particular needs, the PumpSpy system can give you great peace of mind – including text, email, and online alerts through the PumpSpy app to keep you apprised of the condition of your basement, letting you check on your system anywhere and anytime. Free 24/7 monitoring is included through PumpSpy directly, and the system comes with a 3 year full replacement warranty! 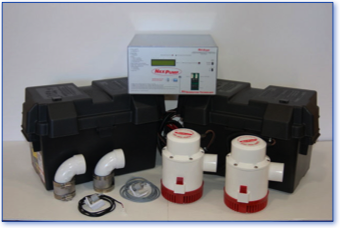 Call us and schedule an in-person visit so we can review your PumpSpy backup system options. The Sumpro Model 100 is an intelligent battery backup system and power inverter from the good people at Ion Products of Illinois, and we recommend this system for appropriate installations in our customers’ homes. 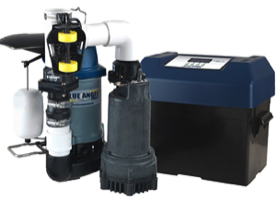 This Sumpro can be used with pumps having a variety of horsepower ratings, and it has an improved feature set including a reduced footprint (to take up less of the precious space in your basement) and even quieter operation. An easy-to-read LCD allows for real-time monitoring of the system and its status. There’s also an alarm contact capability, giving you the option of remote monitoring and notification during regular use or in case of emergency. The unit even has battery charging inputs for solar and wind sources! The Sumpro 100 comes with the 15 Amp inverter unit and a dual battery box with a fuse bar (2 batteries, sold separately). The input & output voltage are standard 120 VAC. Optional features include a stand, an additional battery add-on kit, and the Ion Genesis sump pump controller and sensors. A warranty of 3 years is standard. The Blue Angel series of pumps and backup systems are among the most reliable in the industry. Real Dry recommends the DF50 (1/2 HP) and DF33 (1/3 HP) backup installations, depending on the particular needs of each customer. Corrosion-resistant thermoplastic impellers, cast iron pump housings, stainless steel float guards, and dual float switches are just some of the high-quality features and construction techniques used in these sump pump systems. Controlled by a microprocessor that tests the unit regularly all by itself – and even sends alerts to the homeowner in advance of any problems – these Blue Angel systems can call up to FIVE different telephone numbers. On & Off level settings that are user-adjustable, a fully-submersible design, and a powerful 12 VDC motor are some of the other features of the DF50 and DF33 pump systems. Requires one 75 or 40 Amp battery for operation. These units come standard with a 3 year warranty. How about a backup or even primary pump system that incorporates self-testing? A system that implements advanced, Real-Time Diagnostics and can be programmed for notification status in case of emergency – or maybe while you're on a vacation or a business trip? This technology is available from NexPump and offers complete peace of mind that you have state-of-the-art protection against damage to your personal possessions. Ask us about these Next Generation backup systems that are available now. DON'T WAIT for disaster to strike – contact Real Dry at 1-855-DRY-TODAY or us to talk to a local waterproofing expert you can trust. Proudly serving MA, northern CT, RI, and southern NH with backup systems since 1985.